People accuse the i2b team of elitist snobbery, of being blind and deaf to the kinds of entertainment that “real people” might enjoy. P’tah, saith the team: The i2b brow covers the full range, from low to high and all points in between. 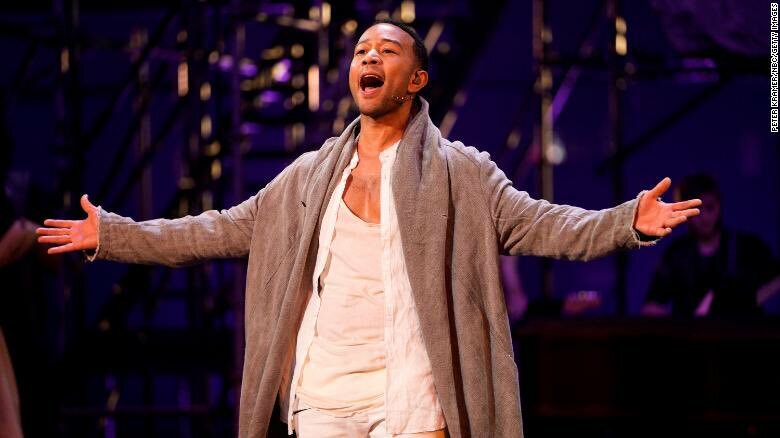 In that spirit: NBC’s Jesus Christ Superstar Live in Concert was just about perfect in every way. The sets and staging, the costuming, the direction: all of this was as good as it gets. The cast was superb, especially the Broadway pros. Better: the cast was determinedly multi-culti and scruffy as hell, all angular haircuts and tattoos.1America’s grumpy pervert uncle Bill O’Reilly took to Twitter to decry this last bit. Get off his lawn. In this production, Jesus is a Black man, his “companion” a White woman. You better believe Black Jesus Matters. The expected troll backlash from the religious right never really materialized. A fair number of theologically inclined folks complained that JCS does not include the actual stone-rolling-aside episode, a resurrection2See what I did there? of a now 48-year old gripe, but it is hard to see that anyone thinks this production short-shrifted the Christ’s ascension. 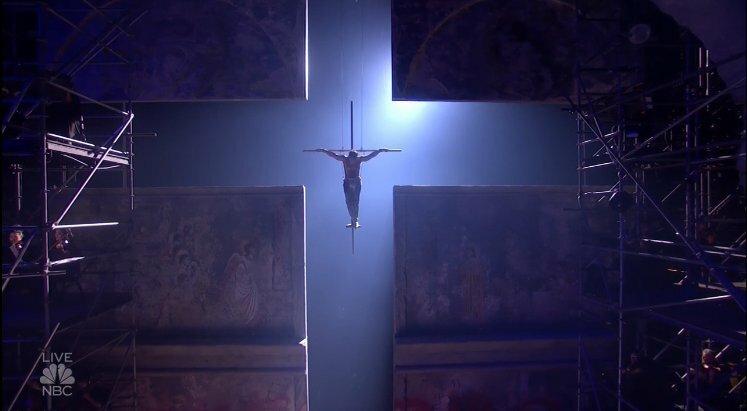 Not to blow the suspense with spoilers, but there has never been a more effective evocation of the Crucifixion than this. Of note: as Jesus ascended, every member of the cast Took. A. Knee. The Christ myth may indeed be the Greatest Story Ever Told. I write this as a fully convinced atheist, but that really isn’t germane, any more than are my thoughts about the reality of Hogwarts or Mordor. This is strictly about the narrative, and this story has it all: rebellion, romance, social justice, and brutal oppression. It’s about class division and capital punishment and the mechanics of social movements. And crucially, it is about betrayal. When the original JCS album came out in 1970, I damn near wore the grooves flat. Raised in church, indentured as an altar boy until such time as I could effectively object, I was taken by the representation of Jesus as a man, a mortal product of time and circumstance. Divine? Maybe, maybe not. Die if you want to, you innocent puppet. And what about Judas? History’s greatest villain, condemned by Dante to the 9th Circle, he remains by far the most complex and interesting character in the myth. But I, like many others, was raised with a black and white conception of Jesus-good-Judas-bad, a stance that pointedly ignores the fact that without Judas, there is no arrest, crucifixion, and resurrection. No Judas? No Christianity. This was one of our earliest lessons in ambiguity, and it remains perhaps the most prevalent. 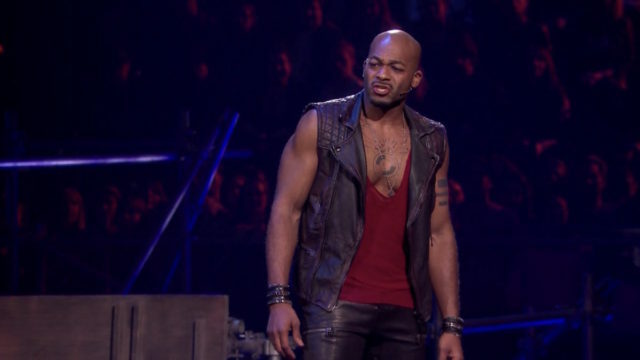 As good as Legend was as Jesus, Brandon Victor Dixon’s Judas stole the show. Already a Broadway giant, most recently as Aaron Burr in Hamilton, Dixon can write his ticket to any destination as of last night.3The fact that Dixon was the actor who gave VP Mike Pence a public dressing down after a Hamilton performance only makes him all the more spectacular. And then the man offers the Wakanda Forever gesture during the curtain call?!?! FTW! One of the great feats of JCS is the representation of Judas as something more than a cardboard villain, more nuanced than Palatine or Voldemort.4The bad guy=pure evil equation has never offered much dramatic possibility. Judas had insight into the perils of personality cult. In the first song, he warns “all the good you’ve done will soon get swept away / You’ve begun to matter more than the things you say”, a timely caution for our favorites in current social movements as they navigate that assembly line of hero creation and defenestration that remains popular 2000 years on. The depiction of the crowd as a gaggle of media hounds after the arrest of Jesus was a clever twist (as was the wide use of cellphones among the cast) that framed the events in relation to current movements like #NeverAgain and #BlackLivesMatter. The production may not have been conceived with these in mind, but you would have to deliberately choose to not see the echoes. Every word you say today. Gets twisted ’round some other way. And they’ll hurt you if they think you‘ve lied. Judas, famously, betrays Jesus with a kiss. In the JCS depiction, Jesus gathers Judas in a tight embrace, a clear display of affection for his old friend who, like himself, finds himself a pawn of forces beyond their reckoning. Is Judas, the universal symbol for betrayal and damnation, forgiven here by Jesus, the singular emblem of mercy and redemption in our canon? God, I hope so. Dante be damned. I’ll go toe-to-toe with anyone to defend the premise that re-tellings like JCS – and Scorsese’s Last Temptation of Christ – do more to imbue the myth with the kind of layered meanings that encourage considered reflection and exploration than do the Sunday school bromides of my youth. Is Judas a man beyond redemption? Perhaps, although it’s hard to imagine a more vibrant redemption than Judas returning from the grave in a sequined tank top to tear the roof off the joint with the anthemic title song. When I come back from the grave, I want to be this fabulous. I have not listened to JCS in more than 20 years, not since the Atlanta music community5Spearheaded by multi-talented Michael Lorant as a gun control benefit vehicle following his own shooting during a botched holdup; some things never change. mounted a terrific production of JCS with the Indigo Girls in the two lead roles. Presenting the out and proud Amy Ray as Jesus – and she killed it, from the moment her disembodied voice blasted into the Variety Theater on opening night – and the out and proud Emily Saliers, as Jesus’ “companion” Mary, was a provocative and daring move, well beyond central casting’s White Jesus, and surely the most daring JCS casting ever sold. Until now. The diversity of casting and the representation of the apostles as scruffy misfits alone made the NBC production a statement. The presentation of Jesus as a Black man, and his female companion a White woman, could fairly be interpreted as a poke in the eye of America’s conservative culture warriors. For centuries, Western culture has insisted on depicting Jesus as some kind of Nordic or Aryan icon. Not this night. I’ll say it again: Black Jesus Matters, and the fact that NBC presented a depiction of the Christ myth that leaned hard on inclusion and diversity, and on the holiest day of the Christian calendar no less, is no small incident in the current climate. Or maybe I’m wrong, and this is all about nostalgia and the willingness of a corporate behemoth like NBC/Comcast to manipulate us all for profit. It is certainly possible. No doubt, nostalgia plays a large part in my emotional response to JCS. A big part of my childhood, I know the lyrics and music to this show inside and out. Judging from Twitter, I am one among many. It is as firmly imprinted as any cultural artifact can be. My favorite gibe comes during the Last Supper, when most of the apostles are drunk with wine and enthusiasm for a movement they do not fully comprehend. So they’ll all talk about us when we die. Perhaps the Gospels were the first tell-all memoirs, the Apostles the creators of the genre. Scores of ex-White House staffers offer their thanks. 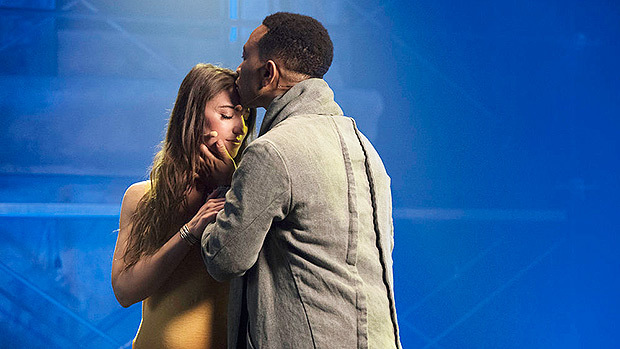 There was a ton of energy surrounding the performance, and the decision to have a live audience served JCS well where other recent broadcast musicals fell short. There was an apparent emotional connection at work in the venue, and that spilled over to the broadcast, even where it created technical issues with sound balance and such. But quibbling over mix problems is as beside-the-point as griping about commercial interruptions. Success for such a production comes down to a central concern: can the viewer emotionally connect? I admit it. I spent most of the evening with my cheeks wet. Mary doesn’t know how to love him. Judas doesn’t either. Jesus has galvanized a movement that is spinning out of his control. He recognizes too late that his followers are not up to the tasks of the movement, aside from Judas, perhaps, a man who is destined to betray Jesus to death. Jesus confronts the money changers and runs them from the Temple. For his trouble, Jesus is swarmed by lepers and other afflicted supplicants; pulling and tearing at him, everybody wants a piece for themselves no matter the cost to their saviour. The devoted dozen fall asleep as Jesus fairly begs someone to stay awake with him in his last night of freedom. Then comes Peter’s betrayal, three times, and Magdalene’s comment, “You’ve gone and cut him dead.” Then there is the agonized death of Judas, the man who made Christianity possible, recognizing that he is, indeed, damned for all time. Despite the insistence of the devout that Jesus is indeed a manifestation of the one, true God6Setting aside Nicene confusions of a Trinity that is or is not in fact a single entity, the way we tell ourselves/each other stories all but guarantees that there is not a single iconic representation of Jesus that prevails universally, despite the best efforts of Renaissance artists and the various approved councils, papal conclaves, and authors like Dante and Milton.7Always keep in mind that a great deal of myth that people assume is from the Bible is in fact addenda created centuries past the authoring of Revelations. All of which means that when a major teevee network devotes millions of dollars to a star-studded presentation of the Christ myth – on Easter Sunday, no less – it is worth paying attention to how this story is being told. Which Jesus, or whose, is always a question worth asking. Is this the Jesus of Harriet Tubman or Robert E Lee? Is this blond and blue-eyed Jesus or Jesus with dark skin and napped hair? Is this Jesus divine or mortal? JCS does unbelievers the service of offering a Jesus that can belong to anyone.8This may in fact be the greatest objection conservative theologians have to the proceedings. Watching it, I am reminded that even the non-believing “I” can have a Jesus, just as I can have my Beowulf, my Hamlet, my Ulysses, my Jean Valjean. Interpret the myth as you will, in a way that enables and ennobles you. If your slate is clean, then you can throw stones. If your slate is not, then leave her alone. These are stories we tell ourselves, in order to live. They belong to everyone. 1. ↑ America’s grumpy pervert uncle Bill O’Reilly took to Twitter to decry this last bit. Get off his lawn. 2. ↑ See what I did there? 3. ↑ The fact that Dixon was the actor who gave VP Mike Pence a public dressing down after a Hamilton performance only makes him all the more spectacular. And then the man offers the Wakanda Forever gesture during the curtain call?!?! FTW! 4. ↑ The bad guy=pure evil equation has never offered much dramatic possibility. 5. ↑ Spearheaded by multi-talented Michael Lorant as a gun control benefit vehicle following his own shooting during a botched holdup; some things never change. 7. ↑ Always keep in mind that a great deal of myth that people assume is from the Bible is in fact addenda created centuries past the authoring of Revelations. 8. ↑ This may in fact be the greatest objection conservative theologians have to the proceedings.